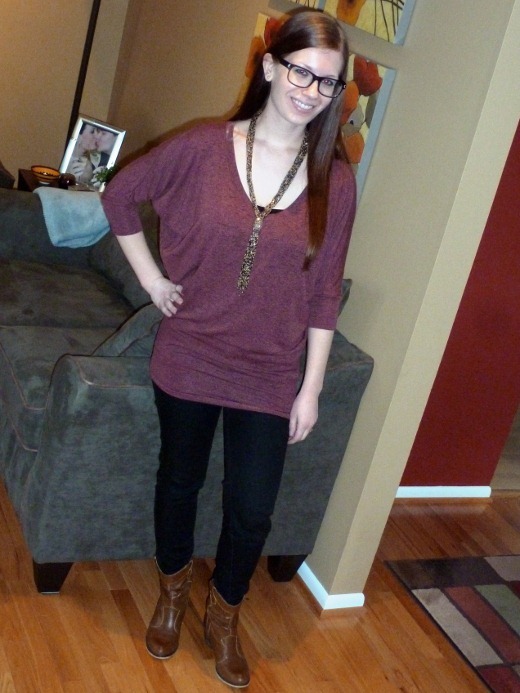 Last week I had my second experience with StitchFix. You can read about my first Fix here (and learn about how this company works, too). I scheduled this Fix to arrive in time for my birthday, as a gift to myself. I’m worth it! Those few seconds after tearing into the box but before revealing any of the contents beneath is just too exciting. Hope, excitement, anticipation. My second fix contained the standard number of five items, including one accessory, and four clothing items, which in my case included three tops and one skirt. 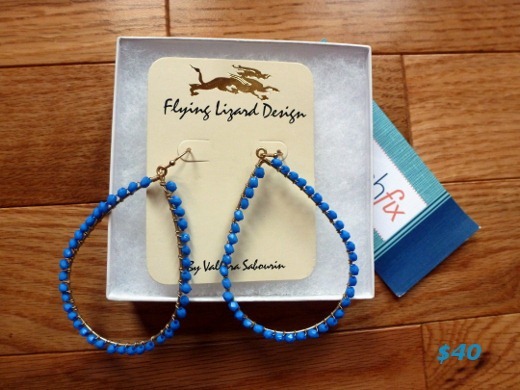 I really like the style and color of the earrings, but didn’t love them though to justify the cost. My stylist Miranda included a note which my shipment indicating that she chose this item because she saw on my Pinterest board that I like polka dots (so true!). Even though I indicated that I typically like to avoid beige and white (I like color! 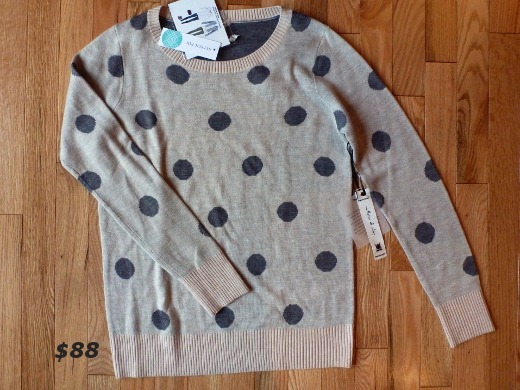 ), this sweater has a grey undertone, of which I am a fan. As the styling card suggested, I paired this sweater with a bright, pop-of-color collared shirt underneath. Unfortunately I just felt that I looked bulky in the sweater, and that it was not figure-flattering. I also prefer more color. I absolutely LOVE tie-front blouses and was happy to see the inclusion of one in my shipment. The fine fabric was soft and silky, but appeared to wrinkle easily. Unfortunately I already own a black tie-front blouse and wasn’t really in the market for a second one. I still tried on the one included in my fix and I really didn’t like the fit. It was too small and very tight across my shoulders, and the fit around the neckline was low and just weird. This photograph also inspired me to return these pants I recently purchased (but haven’t yet worn – the tags are still on!). They are NOT flattering!!! This is NOT a cute picture! Yuck. In my StitchFix Style Profile, I indicated that I prefer to not receive dresses, since I very rarely wear dresses (I do like them, but the dress code at my job just isn’t that dressy), but I guess that does not exclude skirts. Skirts are something I pretty much NEVER wear. Maybe because I was lacking a nice wardrobe-staple skirt, like this one? I was pretty skeptical when trying on this skirt. I begrudgingly pulled out some worn nylons from the back of my sock drawer, started putting them on, and then exclaimed aloud, “Ain’t Nobody Got Time Fo Dat!” Yeah I’m an odd one. Usually I just don’t DO nylons. Then, I kid you not, 10 seconds later, I caused a good 10 inch run in the nylons. TRUE STORY. This is why MegDon’tGotTimeFoDat. So, fortunately for my photography purposes, the run in my nylons was on the back of my right calf. Believe me. Gah. But… after I had this whole ensemble together, I changed my tune! So polished, so put together, Megan! The fit of the skirt was pretty much perfect, so much so that I was a little bit shocked. It fit well through the waist, and the length made me feel young and hip, but not skanky. Plus a skirt with pockets!? Cannot beat that. This is also a very versatile piece, worthy of being a wardrobe staple. 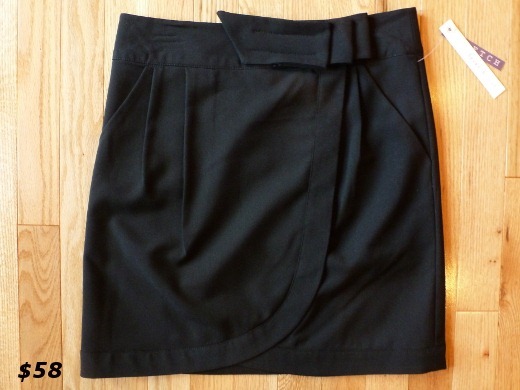 So StitchFix convinced me, who NEVER wears skirts, to buy a skirt. Now I just need some new tights. When I first saw this top I was immediately not a fan of the shape. 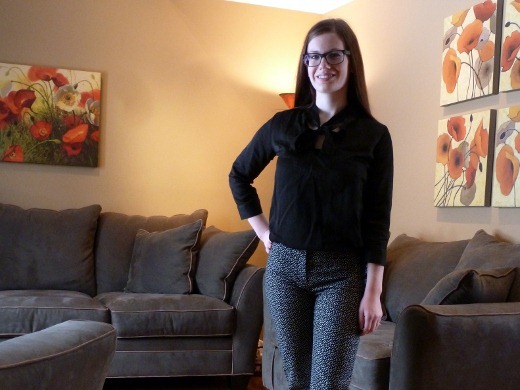 In my profile, I indicated that I preferred form-fitting clothes that show my figure (I worked [and work!] hard for this body! ), so the bagginess of this top didn’t immediately sell me. I tried on this top with skinny jeans, brown cowboy boots, and a brown beaded statement necklace. The top was low cut so I wore a cami underneath as well. Once I had the top on, I liked it much more and could possibly imagine myself wearing it to work or to casual weekend outings. But, at the end of the day, I just couldn’t get over how baggy the fit was (despite the fact that it was a bit more fitted around the hips). I debated for a long time about keeping this one, but ultimately decided to send this one back. Like last time, my StitchFix experience was super fun. This was a great birthday gift to myself. Though I can only afford to get a fix once every few months, it’s definitely an exciting and special treat for a busy gal who loves fashion once in a while. I’ve included referral links to StitchFix in the post, as referrers receive a credit for referring others to the site, in case you have any interest in filling out a style profile and receiving your own personalized StitchFix package. There is a short waitlist to join the site but I did not have to wait long until I made it in, as a heads up. 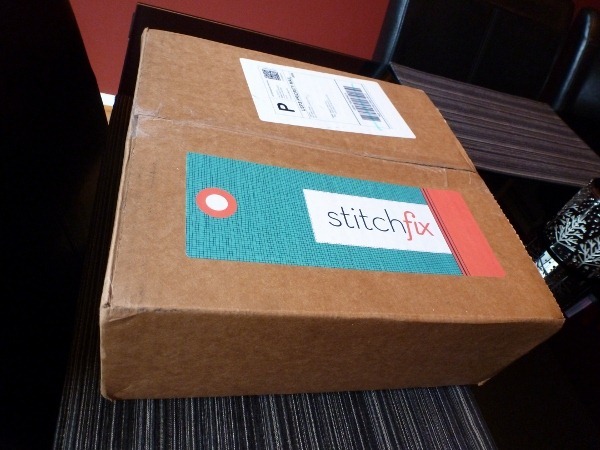 In case you missed it, read about my First StitchFix Experience HERE. Glad you like! The skirt was a pleasant surprise! If you need new tights… I swear by Spanx reversible tights. I wear dresses everyday and I LOVE these control top tights. They are tight when you first wear them but they stretch out in time. They have regular tights and then the reversible ones- black/brown or grey/black. They are pricier but WORTH IT!! You’ll have them for years especially if you don’t wear them as often as I do! YES I am definitely looking for a tights recommendation! I am so tired of cheapy tights I can only wear once or twice before they run and would really like to invest in a nice pair. I will try some of those Spanx – thanksss! 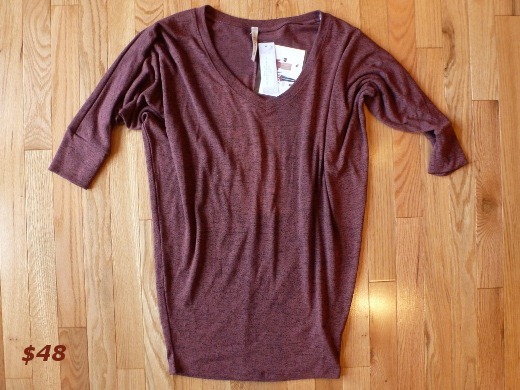 Pingback: My Third StitchFix Experience | Meg.Goes.Nom.Nom. work on. You’ve performed an impressive task and our whole group might be grateful to you. 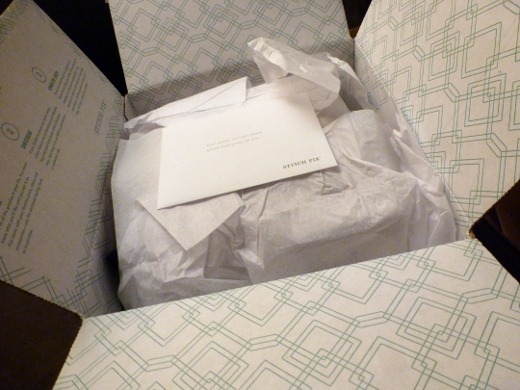 Pingback: My Fourth StitchFix Experience | Meg.Goes.Nom.Nom. 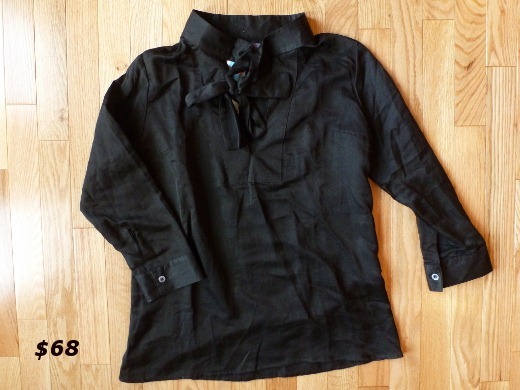 Pingback: My Fifth StitchFix Experience | Meg.Goes.Nom.Nom.